Johari, meaning jeweler in Hindi, gives you a hint on the main theme of the market. Johari Bazar is the shoppers’ paradise for jewelry and ornament. You can find glittering gold, silver, emerald and all kinds of gemstones here. This attracts both jewel brokers, people who are getting ready for wedding and ladies who just love more ornaments. And there are other kinds of crafts that are suitable as souvenir to friends and family too. 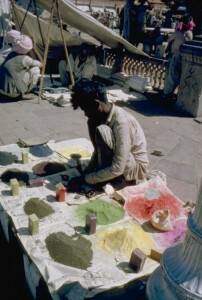 Situated between Badi Chaupar and Sanganeri Gate, this busy market is one example of the ancient Jaipur market. Skillful craftsmen descended from one generation to another are all working here to make fantastic jewelry and all kinds of crafts. Besides jewelry, saris lehngas with beautiful embroideries are everywhere. The famous Jaipuri Rajai (soft cotton quilt) are one top seller in Johari Bazar too. If you are feeling hungry or simply want to rest your feet, don’t miss out a visit to the LMB (Laxmi Misthan Bhandar). This halwai owned brand is famous for the vegetarian restaurant and the sweet shop (which descend from 18th century when Jaipur was first built). Paneer ghewar, mawa kachori and dahi vada are a few famous Indian desserts they made.